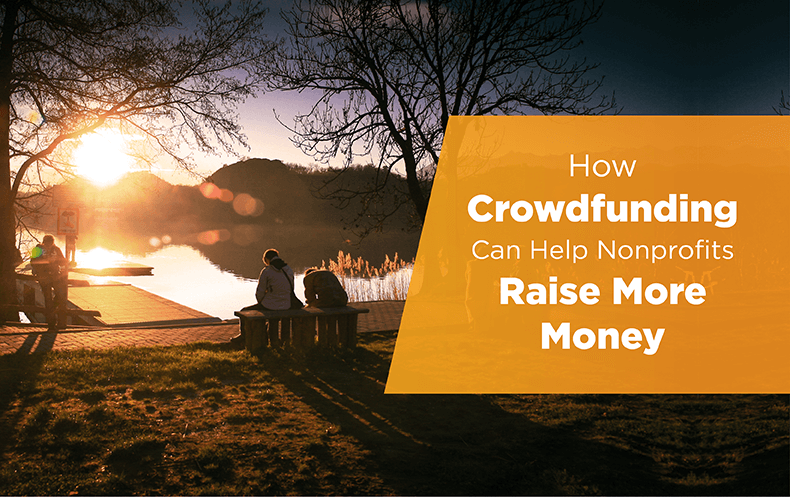 Often conflated with peer-to-peer fundraising or assumed to be only for individuals, crowdfunding is one of the most misunderstood forms of fundraising out there. However, crowdfunding can help nonprofits to raise more money, increase cause awareness, and acquire a large base of new donors. It's an excellent addition to any fundraising strategy! In this article, we'll clear up some of the mystery surrounding crowdfunding and explain just why exactly it's so effective! How do crowdfunding campaigns work? What resources do you need for a crowdfunding campaign? How can crowdfunding help nonprofits raise more money? What are some crowdfunding best practices? By the time we're done, you should understand the basics of crowdfunding and (hopefully) be inclined to try it out for yourself! Crowdfunding doesn't differ that much from nonprofits' regular online fundraising efforts. However, there are certainly a few major factors that set it apart. To understand crowdfunding, it's best to put it into context with annual giving, which as you know, is the nonprofit's largest and most generalized fundraising effort. With annual giving, about 60% of the fundraising goal is constituted by major gifts, which comprise only about 10% of the total annual fund. In simpler terms, a very small number of large gifts make up over a majority of the overall fundraising goal. With crowdfunding, on the other hand, nonprofits reach their fundraising goals by collecting a large number of small donations. It's a more collective effort that relies on a large number of donors to be successful. Additionally, crowdfunding campaigns are usually more clearly defined than other nonprofit fundraising campaigns. They set forth a clear-cut goal, work toward funding a specific cause or project, and take place over a more condensed period of time marked by a set end date. In a modern context, crowdfunding campaigns generally take place online, with the nonprofit sharing a campaign page over social media and email and encouraging supporters to forward the campaign to their networks, too. However, some nonprofits also host live crowdfunding campaigns during fundraising events, wherein they ask their attendees to help them meet a specific fundraising goal and supporters pledge donations in a live auction style. In summary, crowdfunding campaigns are highly social online fundraising efforts that require the support of a large base of donors to meet their goals. They help nonprofits reach a definitive, quantifiable goal meant to be allocated toward a particular cause or project. To host a crowdfunding campaign, you'll need to start by deciding which specific project or cause to center your campaign on. Then, set a clear, quantifiable goal by determining exactly how much you need to raise to fund it. You'll also want to decide on a timeframe. The typical crowdfunding campaign lasts for around 6-9 weeks, but they can be as short as 24 hours (giving days, like #GivingTuesday, are essentially a type of crowdfunding campaign). You'll need some special tools to facilitate your crowdfunding campaign (more on that below). Primarily, you'll need to build out a main crowdfunding campaign page where you can explain your cause and goals and accept donations. If you're including a peer-to-peer aspect (which many crowdfunding campaigns do), you'll also need to help your fundraisers create individualized donation pages that link up to your main crowdfunding campaign page. When setting up your page, the goal should be to make it as digestible and shareable as possible. Include a brief but compelling story and relevant, high-quality photos to illustrate to prospective donors the importance of the project you're raising money for. The more that you can bring your cause to life and help donors visualize the positive impact that their contributions will have, the more successful your campaign will be. A common trait based on measuring the the top nonprofit crowdfunding platforms is that campaigns that are shared fewer than two times have a whopping 97% chance of failure. In other words, sharing your campaign multiple times and through multiple mediums makes it exponentially more likely that you'll achieve your crowdfunding goals. And it only makes sense; potential donors are far more likely to find your campaign if you're regularly bringing it to their attention than they are to stumble across it amid the flood of other content in their inboxes and on their newsfeeds. That means once your campaign start date rolls around, you should start sharing ASAP! Take to social media and send out a blast to your email list that includes the link to your campaign page. You should also encourage your supporters to share your page with their networks as well. As the campaign progresses, it's important to keep sharing your page regularly. Of course, you don't want to bombard your donors with asks, but it's essential to keep the campaign fresh on their minds. Throughout the span your crowdfunding campaign, it's also important to post regular updates. It breaks up your donation asks. By posting a variety of content related to your campaign, you're more likely to avoid donor fatigue. Plus, it provides a more natural relationship-building opportunity with your donors when you provide them with valuable information instead of just asking. It encourages more giving. Keeping your donors updated helps them more clearly visualize what their contributions could achieve. This is especially true if you're able to go beyond just sharing the progress you've made toward your fiscal goal and can give updates that show the actual work toward your project or cause that donations have already enacted. When donors can see exactly how their contributions can reap positive change, they'll be more inclined to give to your campaign. Ultimately, updating supporters throughout your campaign (especially if it's over a more extended period of time) can influence how much you're able to raise and how well you're able to connect to your donors. Don't forget to keep them posted! If you follow all of these steps, your organization will be well-positioned to meet or even exceed your crowdfunding goals. Once your campaign has come to an end, all that's left to do is to give your supporters a final update, send everyone who contributed a thoughtful (and timely!) acknowledgement letter, and evaluate your performance to see if there's anything you could improve next time around. Crowdfunding campaigns require many steps, but they're relatively easy to pull off when compared to other types of fundraisers. Just remember to tell a stirring story, share your campaign page frequently, and give your donors regular updates to nurture the greatest chance of success. Ok, it's partially covered in #5 but we can't stress the importance of saying thanks enough. Your friends, family, and supporters opened up their wallets and generously contributed to your cause. Take the time to thank donors and let them know how the funds will be used. If you're able to personally follow-up with individuals you'll wow your supporters! Any specialized effort requires specialized tools, and crowdfunding campaigns are no different! The most important tool in your crowdfunding tool belt will be crowdfunding software, a type of fundraising software built specifically to help nonprofits run crowdfunding campaigns. While it's technically possible to run a campaign without specialized software, using a crowdfunding platform will simplify and improve this effort significantly. Crowdfunding software enables your organization to build and customize a main campaign page where you can share your story, photos, and campaign updates. You can even feature a fundraising thermometer on your page that updates in real-time as supporters submit donations to help donors visualize your progress (which, as we've already covered, leads to more donations!). The other main feature of crowdfunding software is that it includes powerful social sharing tools that you and your supporters can use to spread the word about your campaign with just the click of a button. All-or-Nothing. With all-or-nothing crowdfunding models, your organization will only receive the funds you raise if you meet your goals. While all-or-nothing models may initially seem unattractive, their riskier nature can be a great incentive to work harder at promoting your campaign. Keep-It-All. A keep-it-all crowdfunding model allows your organization to keep all donations you receive whether you meet your goals or not. Keep-it-all models are safer, but you'll have less motivation for meeting your goals. Salsa Labs - The peer to peer fundraising software is perfect for nonprofits. Kickstarter - It's popular for individuals looking to bring creative projects to life. Fundly - It's popular for individuals raising money for personal causes such as medical needs, church trips, or pet-related causes. The type of software you go with will ultimately depend on what works best for your organization (are you invigorated by a little bit of risk or would you rather be guaranteed at least part of your goal in return for the time and money you put into your campaign? ), so think long and hard before selecting a platform. If you're looking for more suggestions, we recommend you check the top list from Crowd101. 2. A strong online presence. Online crowdfunding campaigns are best suited for those organizations who have a strong online presence and a base of supporters who are responsive to digital fundraising and communication channels. If your donors have mostly interacted with your organization offline in the past, online crowdfunding might not be right for you. As we covered in the last section, crowdfunding campaigns take constant upkeep to be successful. You'll definitely want to assign one of your staff to head this effort and update your page throughout the campaign. If you're running a peer-to-peer campaign in conjunction with your crowdfunding effort, this person will also be in charge of helping your fundraisers get set up with their pages and providing them with assistance throughout the campaign. While not necessary, incentives can help bring your crowdfunding campaign to the next level. By associating gift levels with rewards, you can motivate donors to give and potentially push your average donation amount slightly higher. If you decide to use incentives, you need to be cautious of the type of rewards to give. Some donors may feel guilty about receiving a gift in return for their contribution, which can deter them from giving altogether. Your rewards should be impact-driven. In other words, give donors incentives that will showcase their support. For example, let's say you were running a crowdfunding campaign to help build a new wing for your school. You should pick items like branded products. Not only will the item have some use, but donors will have a sense of pride every time they wear or use the product. $25 buys X and is rewarded with a school spirit water bottle. $50 buys X and is rewarded with a school spirit water bottle and t-shirt. $100 buys X and is rewarded with a school spirit water bottle, t-shirt, and ballpoint pen. Keep in mind that you don't have to spend money on products to provide incentives; they can also be special experiences and opportunities, like VIP treatment at your next fundraising event. All that matters is that you provide incentives that will appeal to your supporters interests and motivate them to give. Crowdfunding campaigns take some special resources. Make sure you have everything you need in advance to ensure that your campaign runs smoothly and successfully. Now that you understand crowdfunding, let's talk about why it's such an effective strategy for nonprofits. The structure of crowdfunding includes many aspects that naturally make it conducive to raising money more quickly and increasing donor acquisition rates. 1. There's a social influence factor. Since crowdfunding relies on a large collective of donors and widespread sharing to be successful, there's a natural social influence factor that comes into play. Crowdfunding software makes the fundraising process incredibly transparent; most platforms will display your progress in real-time, and many even show the names of donors who have given and how much they gave. Being able to see that other donors have contributed can spur people to give, since they know that others have faith in the work you do. Plus, knowing how much others gave can make donors feel more confident about contributing, since they have a better idea of what they're "expected" to give. Crowdfunding campaigns are usually more urgent than other types of fundraisers, which can take place over longer periods of time and have no set end date. Having such a short amount of time to donate and help you meet your goal will motivate donors to give fast! If they care about the work you do, they'll have to drop what they're doing and donate now, or else run the risk of missing out on supporting your campaign. The clearly defined parameters of crowdfunding campaigns can make donors feel more confident about giving. Since crowdfunding campaigns put forth a specific goal and work toward a specific project, donors can more clearly equate their donations with concrete results. They know exactly what their contributions can achieve and how much it will take to get there. This concreteness provides the perfect context for new donors to give. Because they've never given to your cause before and aren't familiar with the good work that you do, new donors often feel more comfortable giving when the results of their donations are made crystal clear. There's no doubt that crowdfunding does this, so if your organization can get the word out, you're sure to be able to reach lots of prospective supporters that you wouldn't be able to otherwise and recruit them to your cause. In simpler terms, crowdfunding campaigns can give your donor acquisition a significant boost! As we've touched on before, crowdfunding campaigns thrive off of being shared far and wide. In fact, crowdfunding software was built to help organizations create story-oriented pages that bring their cause to life in a very tangible way and share them over email and on social media with ease. Because they're so shareable and their format is ideal for recruiting new donors to your cause, crowdfunding is an excellent way to expand your organization's reach. Being able to share quickly and in such an appealing format is another reason why crowdfunding can help you bring in lots of new donors. The format of crowdfunding has many built-in benefits that can help nonprofits raise more money and acquire a high volume of new donors quickly. Don’t let crowdfunding’s simplicity fool you! To become successful, you’ll need to organize your campaign and use the right tools so that your fundraiser can triumph. First—and perhaps most importantly—you need to optimize your crowdfunding page. In other words, you’ll need to ensure that potential donors can get all the information they need to compel them to give. Depending on the crowdfunding platform that you use, you’ll have different capabilities as far as customization and features go. Adding your logo and color scheme. Posting images and videos to your crowdfunding page. Using giving levels and incentives when applicable. After you’ve enhanced your crowdfunding page, you can start sharing it with the rest of the world. While most crowdfunding experts tell you to share your campaign on social media, don’t limit your outreach to just online methods. Campaigns that reach or exceed their goals exhaust multiple outlets to motivate donors to give. In addition to communicating on social media, you should also share your crowdfunding page via email and direct mail. You can also ask local journalists to cover your campaign to reach even more potential supporters. The last step to a successful crowdfunding campaign is showing your appreciation. You can thank your supporters with a handwritten note or publicly show your gratitude by highlighting donors on your crowdfunding page—the possibilities are endless! With these strategies, you’ll be closer to reaching your goals and creating a crowdfunding campaign that donors want to support. Which crowdfunding platform should you choose? The crowdfunding platform you decide to use will likely depend on your fundraising needs. Create a list of the features that you want, so you can find the right crowdfunding platform for your nonprofit. To help you get started, look at this great list of crowdfunding platforms. In addition to CRM software, an advocacy platform, and other fundraising software, Salsa Labs offers a crowdfunding/P2P platform for nonprofits to use. The platform helps organizations connect better with their donors through social media integrations and targeted communications. Learn more about Salsa Labs' crowdfunding/P2P platform here. We hope our article has demystified crowdfunding and encouraged you to try it for yourself! For more fundraising resources, make sure to check out our resource page. We have many comprehensive guides that can help you get on your way to better fundraising! Free Download: Peer to Peer Campaign Playbook. Coach, communicate, and crush your next peer to peer fundraising campaign goal! Free Guide: Clear and Complete Guide to Peer to Peer Fundraising: Learn how legislators are avoiding constituents and how your campaign can use multi-channel tactics to break through! Free Demo: Salsa's Peer to Peer Fundraising Software. See how your nonprofit, campaign or 501c3 organization can leverage our peer to peer and event fundraising tools!